Raph, Leo and Mike investigate the skeletal remains in Don’s shell, and discover that the bones aren’t their brother’s! Leo deduces that the bones must be the human remains of the cyborg that Donatello had been fighting. Raphael gets angry and swears vengeance against the Dragonlord and Pimiko – Leo and Mike join the vow. The guys then fly to Komodo Industries in their modified Triceraton aircar. Leo tells Raph to park the car so they can attack under the cover of darkness, but Raph wants to begin the assault now. The two argue until Mike knocks their heads together and tells them they aren’t doing anything until they bury what’s left of their brother. Inside Komodo Industries, Master Splinter does battle with the shark mutant, Mako. Splinter manages to break the behemoth’s nose and avoid its attacks until several giant komodo dragons arrive and attack Mako (who has no problem killing them). During the bloody fight, Splinter attends to the Dragonlord, who has recovered from Mako’s earlier attack. Lord Komodo draws his blade to assist his allies, but before he gets far, he collapses and begins convulsing. Mako arrives and Master Splinter smashes him in the nose again – the sharkman cries out in pain, but then stops his assault as he ponders what’s happening to the Dragonlord. Mako and Splinter watch as Lord Komodo transfroms into a giant komodo dragon. The sight of this disturbs Mako and he runs off, while Master Splinter walks with the Dragonlord back to the room where the komodo dragons were killed. Pimiko and a Komodo Industries executive are there, assessing the damage. Splinter asks the man if the transformation occurs regularly, but Pimiko holds her blade to his throat and tells him he must die for discovering Lord Komodo’s secret. Outside in some nearby woods, the Turtles have built a cairn for Donatello’s remains, thinking that their brother is dead. Leo and Raph head off to assault Komodo Industries while Mike lags behind and cries. Later, the Turtles are walking through a cornfield when Mako crashes past them, being chased by more giant komodo dragons. Mako discovers the Triceraton aircar and leaps into it, making his escape (much to Leo’s dismay). Fortunately, Raph has a remote control that he uses to turn the car upside-down and spill the sharkman out – and then the ninja steers the vehicle back to where the Turtles are standing. Meanwhile, Donatello is recovering from his ordeal. As it turns out, the machine parts of the cyborg he had battled have a life of their own, and after the crash they left their human host and assimilated Donny, thus making him a Teenage Mutant Ninja Cyborg Turtle. 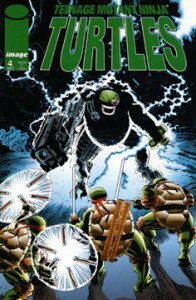 Donatello finds himself walking in the cornfield, and targetting Mako – who he blasts with his new robotic armory.